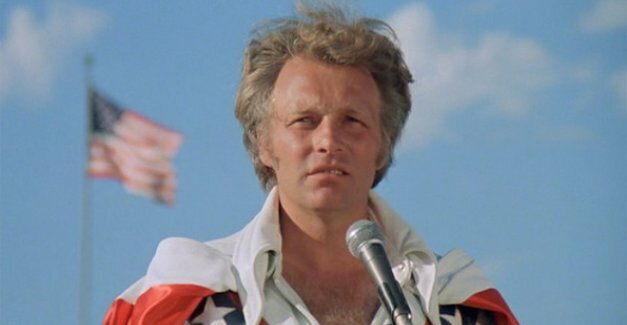 “If you’re not Knievel, you’re not Number One.” But if you are Knievel, your movie is Number Two — in bathroom terminology. Apparently not satisfied with having a biopic made about him (1972’s Evel Knievel, with George Hamilton), Evel signed on to play a saintly idealization of himself in this jaw-droppingly stupid “drama” in which he brings joy to crippled orphans (in the first five minutes, yet) and is surrounded by adoring fans wherever he goes. Evel must’ve had such an inflated view of himself that he honestly didn’t know he comes off as an obnoxious assclown no matter how much the sycophantic script glorifies him. The plot has Evel up against a corrupt promoter (Leslie Nielsen) and a former partner (Marjoe Gortner) while he also tries to bring his bitter mechanic (Gene Kelly) and his estranged son closer together. He also flirts with ball-busting photographer Lauren Hutton (upon learning she’s a feminist, he snorts “So you’re one of them“). The flick’s general ineptitude extends to Evel’s motorcycle stunts, which are shot and edited in such a way that, although it’s probably Evel himself on the bike, you can’t tell for sure; it could be anybody. The dialogue is consistently laughable: when Lauren breaks up a fight between Evel and Gene, she snarls “I’ve had a front-row seat at this ugly spectacle!” Needless to say, she speaks for everyone in the audience. And did I mention Evel’s “performance”? Very much a ’70s film, right down to the TV-movie quality and the ridiculous suits Evel wears. I bet Quentin Tarantino loves it so much he owns a print, though.